Has your child ever had a meltdown when you ask him/her to turn off the TV or iPad? Children spend quite a bit of time “entertained” by toys and tablets and TVs and smartphones. The thing is... these activities do all the work with their bells and beeps and exciting visuals, leaving your child with not a whole lot to do but watch. These activities are easy. They are entertaining. They are addictive. Of course a child is going to melt down when the “fun” is over. While we can all use a mental break once in a while, it’s extremely important to notice how many activities your child gravitates toward that do all the work, leaving your child a passive participant. The early years are CRUCIAL for brain development, since the brain develops more from 0-5 years than any other time in life. The best activities for young children consist of loose parts that, by themselves, do absolutely nothing until your child engages with them. A perfect example is this Engineer-a-Coaster from Lakeshore Learning pictured above. Activities like this require imagination, experimentation, and problem solving... in other words, creative thinking! So, take notice. 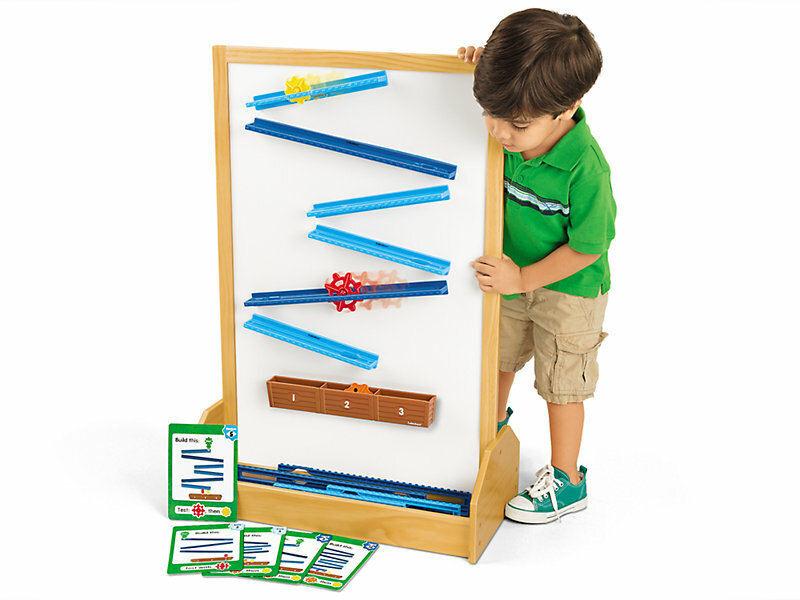 Creative thinking toys don’t have to cost a lot of money. Simply put some tape, string, sticks, boxes, scissors, crayons, etc. on the table and watch your child’s imagination spark. You may need to get things going by helping them create at first, if they are not used to playing this way, but after a few examples and the permission to play freely with no right or wrong results, your child should catch on quickly and become an active player in their real life!